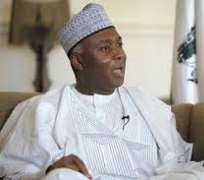 Senate President, Bukola Saraki, on Tuesday, assured Nigerians that the Upper Chamber, will not delay the confirmation of ministerial nominees once the list has been forwarded to his office by President Muhammadu Buhari. Saraki stated this when he received in his office, the French Ambassador to Nigeria, Mr. Denys Gaver, who paid him a courtesy visit. He explained that the fact that the senate suspended plenary, will not disturb treatment of any communication from the president. He also pledged that the National Assembly would constantly cooperate with the executive arm of government to accomplish the programmes of the administration. The senate president said bills from the executive arm of government would be treated with dispatch, as part of efforts to support the president to effect the positive change expected from his administration by Nigerians. The senate president told the French delegation that the Senate had started work already by setting up an 18-member committee to formulate a realistic and progressive Legislative Agenda, for the 8th Senate. He explained that the agenda would address issues like poverty alleviation, law enforcement, national security, commercial disputes, eradication of corruption and investments in the Petroleum sector. Saraki also pledged that the National Assembly will partner with the French National Assembly in the area of capacity building for legislators, and strengthen the bilateral relations between the two countries. He added that the bilateral relationship would also ensure that more French investments flow into Nigeria. The French envoy, who described the leadership tussle at the National Assembly as part of democracy, solicited for cooperation between the National Assembly and the President Buhari-led executive arm of government. Gaver, said the expectation of the international community on Nigeria is high. He also called for cooperation between the private sector in Nigeria and its counterpart in France. 'On security, Gaver said France is encouraging her former colonies in West Africa to cooperate with Nigeria in the onslaught against the Boko Haram insurgency. – Punch.